The Garden of Evening Mists by Tan Twan Eng was bound for the Man Booker Prize in 2012 by Lori Sauer. This copy was published by Mrymidon Books Ltd. and is a story about a Malaysian woman who reflects on her apprenticeship with a Japanese gardener during her younger years. This takes place during The Malaysian Emergency, a time of civil war after WWII. Political and personal struggles dominate a narrative that is set against the backdrop of the creation of a garden in the highlands of Malaysia. I asked Lori to provide a description of the binding, along with her concept for the design. 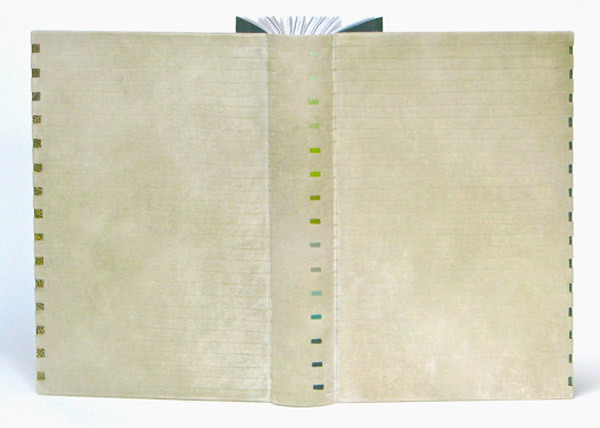 The binding is covered in reverse vellum dyed with acrylic ink and embossed with blind lines. 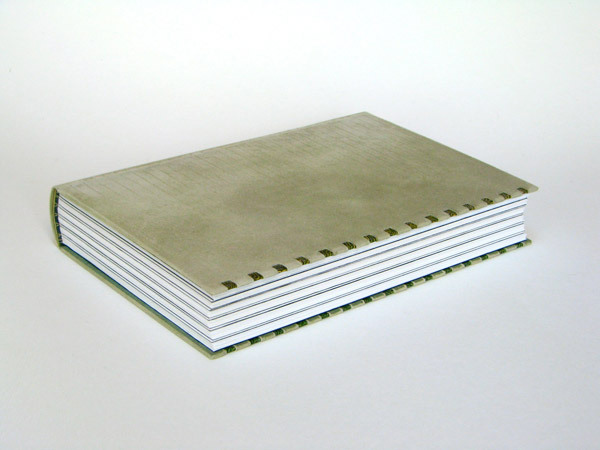 The structure is a simplified binding that is made in 3 pieces. It has under lays of paste paper on the fore-edges and Japanese paper doublures and flyleaves. I used many shades of green on the binding, for obvious reasons. The design happened as I worked while I kept in mind the idea of ‘borrowed scenery’ an axiom of Japanese garden design. 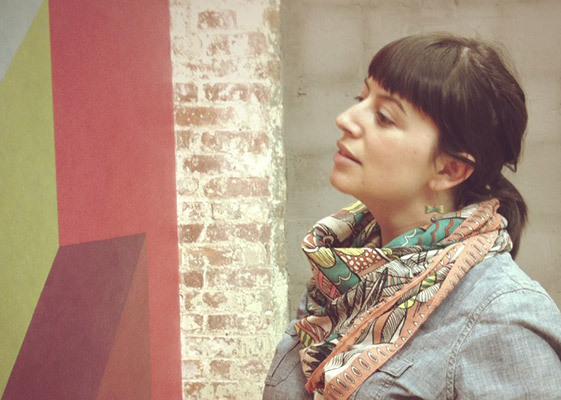 Lori works both independently as a bookbinder and as an instructor, teaching her innovative structures to students with a wide range of artistic backgrounds. Check out the interview after the jump to find out how Lori got into bookbinding and come back every Sunday this month for more work by Lori. For a number of years you worked in publishing before studying bookbinding at The City Lit in London. Can you talk about your path into bookbinding and the training you received through The City Lit. I was working in London at The Poetry Society when I decided I needed a change in direction – back to doing something creative with my hands. I had always drawn and painted and ‘made’ things. A writer friend made a casual remark about having some things bound by the local bookbinder and the idea was planted in my head to find out more about this subject. My job was just 4 days a week so on my free day I enrolled for an adult ed. class at the City Lit. By the second class I was hooked and in time added evening classes and a second day at the then London College of Printing. My tutors were Sally Lou Smith and David Sellars, who was himself taught by Lou. I couldn’t have wished for better teachers and the exacting standards they required. I attended for three or four years before feeling I was ready to set up on my own. I continued to receive tuition in specialised workshops and by pestering established binders with many questions. In retrospect I can see that the things I had done since I was a small child all pointed to the place I’m in now. Apart from constantly making marks on paper, I loved to build things, from a split-level house for my trolls (with all the furniture) to forts in the woods. I studied architecture for a short time in university before switching disciplines to painting and photography. Binding books has turned out to be a perfect medium where I can combine my love of literature, visual interests and building 3D objects. I used to feel I lacked focus and couldn’t settle on what I wanted to do. Now I understand I was doing related and intertwined activities all along. I’ve noticed that you frequently use vellum as the covering material for your bindings. What are your reasons for favoring this material and can you talk about the struggles or favorable techniques you’ve encountered from working with what can sometimes be a tricky material. Leather is wonderful to work with and I enjoyed using it on my earlier bindings. Gradually it lost its appeal as a material to cover the entire book, it didn’t posses the surface I wanted. I don’t remember exactly when or how I decided to start using vellum but I quickly became very fond of it. 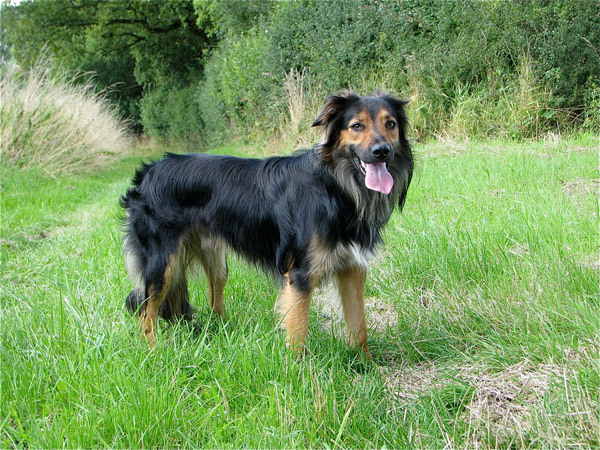 The skins’ markings are all different and I find myself endlessly drawn to their variations. I now often begin with a white skin and colour it to suit. I enjoy experimenting with dyes and get some surprising and interesting results. I have never found it difficult to work with and I put this down to the vellum itself. My supplier is based in The Netherlands and his vellum is lovely, not too much pull and he has a big stock to choose from. By using different structures or covering the boards off the book I can avoid the large joint needed for a full vellum binding (I don’t like the way it looks). I have used reversed vellum on my last few pieces, which gives the benefit of the slightly fuzzy underside, making the book very tactile. Along with the superior strength of vellum, as opposed to leather, it has a historic record of lasting for centuries and maintaining its beautiful characteristics. Your minimal designs yield a sense of thoughtfulness to the text and materials. In addition to your individualistic design is your unique binding style. I’m particularly attracted to the rigid, shaped spine of Kyffin: A Celebration and The Life and Chapters of Sundry Goodly Sayings and the Techniques of Brother Giles, Companion of Saint Francis. Is this a structure you developed? What are the features of its construction that you find appealing? Both of these bindings use a structure I developed and although each is done with slight variations they are similar. It’s a modification of the sewn board binding that originates with Gary Frost; it also has parallels to the construction of some medieval books that use a sewn-on vellum flange to sandwich the boards. I like it because it opens flat, something I strive for in all my work, and has good board movement. The shaped wooden spine came about because I wanted to make the flat back of this structure more sophisticated in appearance. I had to figure out a way to attach it securely while not letting it impede the opening. These particular bindings have small holes drilled in the wood and threads from the sewn text pass through the holes to secure everything together. You’ve founded BINDING re:DEFINED, an organization offering specialized workshops taught by professional bookbinders including yourself, Benjamin Elbel and Emily Martin. As an instructor myself, I can understand the passion for teaching such a significant trade. What led you teach bookbinding? Could you describe your typical student and what aspects of teaching you enjoy most? I fell into teaching by accident. A local college asked me to take over from a retiring tutor and it built up from there. What I have discovered after a very nervous beginning is that I enjoy it. As my own work has developed I have become more committed to passing on my interest in structures and to illustrate how they are a viable alternative to the norm. About half of my teaching is repair and restoration (I run a weekend class for this during the academic year) and the other half is focused on new work. Whatever path a student chooses to follow in binding I am adamant that they all have a solid grounding in how a book is put together. If they don’t understand their tools or materials then the finished product will be a disaster. Many people have come from other disciplines: calligraphy, textile art, photography and architecture. It’s lovely to see them get the bug for binding and add it to their other skills. Opening someone’s eyes to the possibilities in making books is very gratifying. I am on a gentle campaign to inform students that modern texts are unsuitable for Victorian pastiche and that we owe it to the craft to move it into the future. And to top it all, teaching is one of the best ways to learn. The information and ideas that I have received from students is invaluable and inspiring. I’d be worse off for not running classes. In addition to teaching, you also work as a self-employed bookbinder. Can you describe your workspace and the type of work you specialize in. 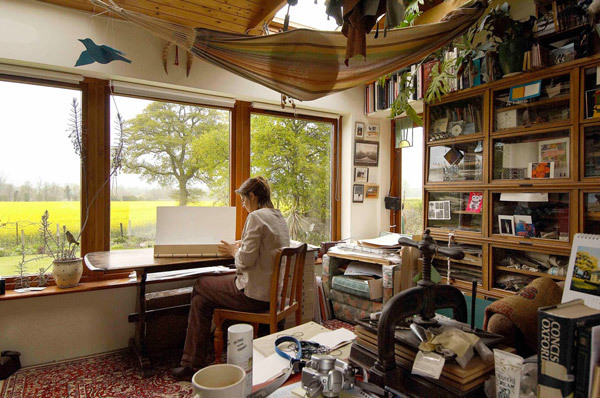 I have a separate studio in my house with big picture windows that overlook very beautiful English countryside. The first thing anyone says when they visit is ‘what an amazing view’. My room is stuffed full of materials and equipment and my working space grows smaller every year. While working I listen to BBC radio 4, a wonderful non-music station that I learn something from every day. I have discovered that running the workshops for BINDING re:Defined takes an enormous amount of time in admin, maintaining the website, etc. It’s a new venture that’s only been going for 2 years and one I am convinced has a place in the binding canon. As it grows and evolves my hope is that it will become an important resource for the study of structures. Bench time is spent on a steady trickle of repair work, commissions for various projects and making bindings for exhibitions. I have a project list for sculptural pieces that I fit in between the other things. My dog, Sev, is with me always and has a dedicated chair in my studio where he snoozes most of the day. He comes to all workshops and has made many friends. Binding is a very solitary occupation and I couldn’t do what I do without his company. Our daily walks together are a great time for me to clear my head and solve design problems. I’d recommend it. Moving Images: Take a Seat – Make a Friend? I LOVE her bindery space!!!! Look at the windows!